The definition of color is a component of light which is separated when it is reflected off of an object. Color begins with light and the colors we see are influenced by the characteristics of the light source. Wavelengths of reflected light determine what color you see. Color is said to be three-dimensional because of it’s three unique aspects. When you seek to define a specific color, there are three properties to consider; Hue, Value, and Saturation. Hue is a name we give colors on the color wheel (red, yellow, green, blue, and so on). It’s basically the technical definition of color perception. Hues have a natural value where they look the purest and some colors, like yellow, are naturally light. While other colors, like violet, are darker. All hues can be made in all values. Adding white paint will make any pigment lighter creating a tint. Adding black paint will make most pigments darker creating a shade. Value is the light and dark property of a color. Saturation (also known as purity) is the level of grayness present. The less saturated, the more gray a color appears. The sensor in a digital camera records light as it actually is. Your eye/brain, however, will always correct light back to “normal” and our brain is constantly compensating to what it sees. The number of photoreceptors in a human eye is estimated to be approximately 130 million rods and 5 to 7 million cones. If you assume a single pixel is equivalent to a rod, you could say it would take a 130 megapixel camera sensor to equal the resolution of the human eye. But there is much more to the story because the eye works much differently than a digital camera. It’s not a perfect comparison. That is … if you are inside a place that is lit with light bulbs, those light bulbs actually transmit a reddish-brown light and white objects will be recorded on film as reddish-brown. However your brain will correct that light and a white object will appear white. The COLOR of the subject is determined by the color of the light source and the color of the subject. The sensor in a digital camera records light as it actually is. Your eye/brain, however, will always correct light back to “normal”. Your brain is constantly compensating. That is … if you are inside a place that is lit with light bulbs, those light bulbs actually transmit a reddish-brown light and white objects will be recorded on film as reddish-brown. However your brain will correct that light and a white object will appear white. Same thing happens inside a place illuminated with fluorescent bulbs. Fluorescent bulbs actually transmit an ugly greenish-yellow light, but your brain corrects that light and it appears white to your eye. Film records that light as greenish-yellow. Fluorescent light contains only enough green and yellow light to photos turn out a bit “off” in color. However, by using a magenta filter in front of the lens, the overall lighting is more natural and “warm”. We will discuss this at length later on. Right now just understand that it happens. RED GREEN and BLUE are Primary Colors. Some people (see some of the comments below) just refuse to believe that green could be a primary color! Well if you’re still not a believer check out how red and green make yellow. RED light rays only contain red because it is a primary color. So GREEN light rays only contain green, and BLUE rays only contain blue. Again, that is because these are the PRIMARY colors. 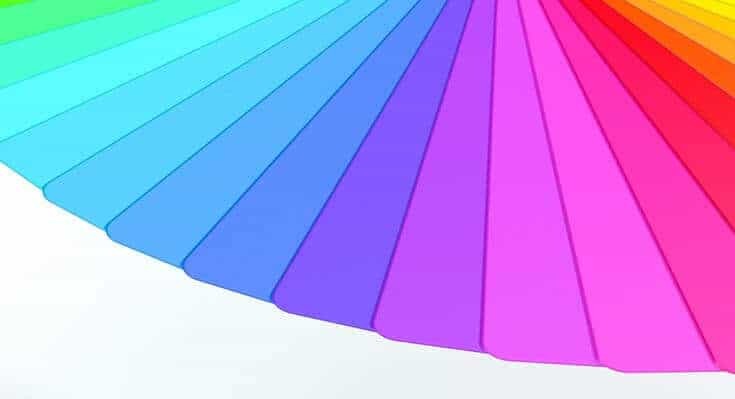 Secondary colors – magenta, cyan, and yellow are considered SECONDARY colors because each one is a mix of two PRIMARY colors. Mixing PRIMARY & SECONDARY colors will give you TERTIARY (third tier) colors …. making up all the visible colors in the spectrum. Here’s another image to show you how using the primary colors, red, green and blue, you can produce the secondary colors. Do Not Worry, there will be no test on this. Just read it and think about it for a while. This concept can be a little confusing as in school we learned that the primary colors are different. We must remember that color in the printing world is what we learned in school, but color combinations are different for light. For photography, we must learn the colors of light, not the colors for printing. In photography we are talking about RGB or colors of light that join together to make white, whereas in print all primary colors joined together would create a neutral color, or gray. Interesting article except if it was completed. At the end where it talks about the Primary and Secondary colors there is a chart and image missing. Not as helpful without them. This comment from the above “You can see how PRIMARY colors and SECONDARY colors mix from the chart below:” in the article but there is not chart below. And also ‘Here’s another image to show you how using the primary colors, red, green and blue, you can produce the secondary colors.” but no image.